All the trout in Dallus Creek are not necessarily “keepers”, but even catching small ones is lots of fun! Almost like clockwork, and on yearly basis, seatrout seem to head into Dallus Creek and the “trout holes” there. It’s usually after the first few days of cold weather, and no one seems to understand the dynamics of this excellent fishing spot. For the most part, Dallus Creek is shallow, but there are a couple of deep holes, rumored to be spring-fed, that attract hordes of spotted seatrout and sometimes legions of anglers. There are two ways to access Dallus Creek. 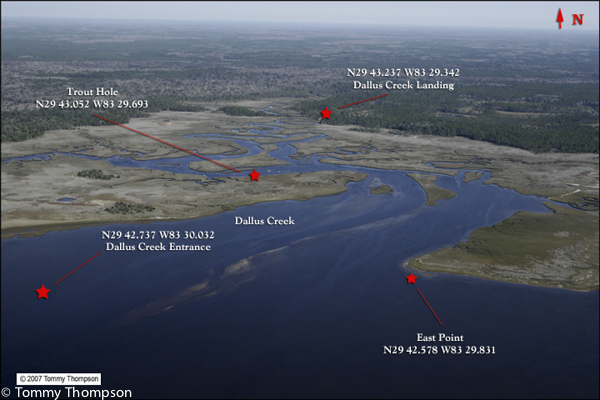 One, if you have a small boat, paddlecraft or airboat, is to launch at the Dallus Creek Landing ramp, just of CR361 north of Steinhatchee. This is an excellent place to launch, but lower-to-the-water boaters (canoeists and kayakers) need to be careful as faster airboats often move fast inside the creek. 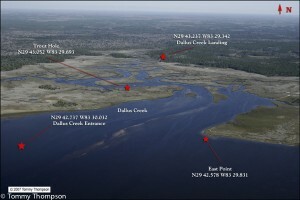 The other option is to enter the creek from the Gulf after launching at either Steinhatchee or Keaton Beach. Anglers using this approach should be aware that low tides may stand them inside the creek holes and that there are many sandbars fronting the creek’s entrance. All sorts of anglers and all sorts of boats appear in Dallus Creek during the seatrout run. If you’re new to the area, you can often find the holes by simply looking for a ring of boats fishing. Otherwise, use your depth finder and look for water that’s 7 to 10-feet deep. The best baits vary, day-to-day, but the tried-and-true method is a live shrimp or Berkley Gulp! pinned to a 1/8-ounce jig head, slowly retrieved across the bottom. Other choices might include Paul Brown Devils or MirrOlure TTR plugs. In either case, be sure bring your ruler to measure your fish. 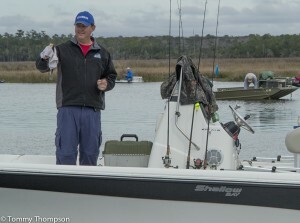 There have been many “shorts” (under 15″) early this season, so careful culling and careful fish-handling is necessary.